Chief, an industry leader in AV mounting solutions, is helping installers with several cart options for XL applications. The XVAU cart was designed for 37-70" displays up to 250 pounds (113 kg). "We saw a need for greater stability to support the extra large displays and touch panels that were on the market," product manager Kathryn Gaskell said. "Fusion's extra large carts come with the versatility needed to support rack-mounted equipment and even two displays at once." 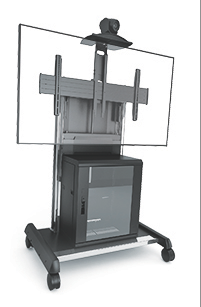 The Extra-Large Fusion Mobile Cart was designed for extra-large and touch panel displays, including the SMART 8000 series, from 55" to more than 100" and up to 300 pounds (136 kg). It has space for internal storage, including hardware to vertically mount 2 RUs of AV gear. The Extra-Large Fusion Video Conferencing Cart comes fully assembled with a camera shelf and 11 RUs of rack rail for rack mountable and non-rack mountable components. The XVAU cart was designed for 37-70" displays up to 250 pounds (113 kg). Both carts can be customized for dual monitor video-conferencing use with the dual monitor accessory (FCA623B). Carts help to share video conferencing and display capabilities across several rooms to maximize investment for corporate, government, or education clients by saving on resources. The XPAU and XVAU are now available.